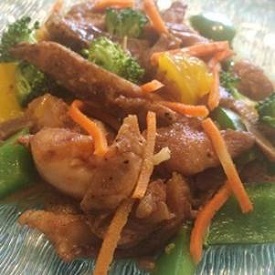 Sweet and crispy orange chicken recipe with mandarin oranges, broccoli, and carrots developed by the California Culinary Centers for school food service menu planning. This recipe yields one–10⅛ inch by 12¾ inch by 6 inch pan of orange chicken with vegetables for 50–4.2 ounce servings: ½ cup or one number 8 scoop. Preheat convection oven to 350°F or conventional oven to 400°F. Place single layer of frozen orange chicken on one–18 inch by 26 inch by 1 inch sheet pan with liner. Bake frozen chicken for 10 to 12 minutes, loosen chicken and turn pieces over with a spatula. Continue baking for an additional 10 to 12 minutes, until golden brown or until internal temperature reaches 165°F. Critical Control Point (CCP): Cook chicken until internal temperature reaches 165°F or higher for 15 seconds. Transfer cooked chicken to one–10⅛ inch by 12¾ inch by 6 inch pan. CCP: Hold chicken at 135°F. Bring water to boil in 10 quart pot. Rinse and chop broccoli florets to ½ inch pieces to measure 1 quart and ½ cup. Peel, trim, and shred carrots to measure 1 quart and 1 cup. Rinse and cut peppers into 2 inch slices or chop into ½ inch cubes to measure 1½ cups. Combine vegetables and place in large colander and blanch. To blanch: pour boiling water over vegetables 1 gallon at a time, plunge the broccoli into ice water, and drain. Set aside. Heat sauce in 10 quart stock pot for 5 minutes to 140°F. Reduce heat and simmer on low heat. Pour one bag heated sauce (36 ounces) over chicken. Reserve ½ bag of sauce (18 ounces). Add vegetables to chicken, pour remaining ½ bag (18 ounces) sauce over chicken and vegetables. Add mandarin oranges and mix together as close to serving time as possible. CCP: Hold orange chicken with vegetables at 135°F. Serve ½ cup or one number 8 scoop orange chicken with vegetables for each serving. This recipe yields two–10⅛ inch by 12¾ inch by 6 inch pans of orange chicken with vegetables for 100–4.2 ounce servings: ½ cup or one number 8 scoop. Preheat convection oven to 350°F or conventional oven to 400°F. Place single layer of frozen orange chicken on two–18 inch by 26 inch by 1 inch sheet pans with liners. Transfer cooked chicken to two–10⅛ inch by 12¾ inch by 6 inch pans. CCP: Hold chicken at 135°F. Rinse and chop broccoli florets to ½ inch pieces to measure 2 quarts and 1 cup. Peel, trim, and shred carrots to measure 2 quarts and 2 cups. Rinse and cut peppers into 2 inch slices or chop into ½ inch cubes to measure 3 cups. Pour one bag heated sauce (72 ounces) over each pan chicken. Reserve 1 bag of sauce (36 ounces). Add vegetables to chicken, pour ½ bag (18 ounces) sauce over each pan of chicken and vegetables. Add mandarin oranges and mix together as close to serving time as possible. CCP: Hold mandarin orange chicken with vegetables at 135°F. Preparation to serve time: 45 minutes for 50 servings and 1 hour and 5 minutes for 100 servings. CCP: Cook chicken until internal temperature reaches 165°F or higher for 15 seconds. CCP: Hold chicken at 135°F. CCP: Hold mandarin orange chicken with vegetables at 135°F.